Karin has red eyes, matching hair colour, and an unusual hairstyle: her hair is short, pointy, and unkempt on the right side, while it is long, pin-straight and combed on her left side. She wears brown glasses, a lavender uniform common for Orochimaru's subordinates, short black shorts, and long black thigh high stockings with shoes. Her chest, neck and arms are covered with bite marks that result from using her Heal Bite, and all of which are hidden by her uniform. Karin has a fluctuating personality; she will appear tough and in control at times, to the point of being violent and critical, and at other times will appear highly flirtatious. 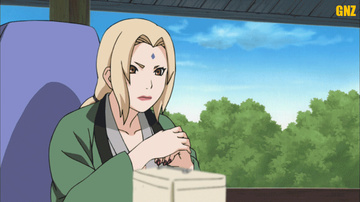 She annoys Suigetsu Hōzuki, whom she attacks whenever he voices his general opinion of her. 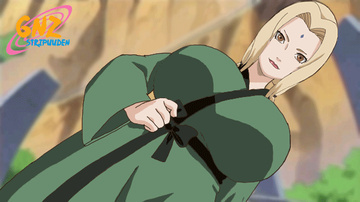 She seems to be attracted to men based on their chakra level, and claims that Suigetsu's chakra disgusts her. Sasuke Uchiha's chakra used to dazzle her, but it now scares her, due to it getting colder and darker from his hatred. Naruto Uzumaki's seems to calm and dazzle her as well, making her feel comfortable and relaxed due to it being warm and bright, though she also became scared after sensing an evil chakra within him.